Is your Twitter Advertising on track to hit your marketing objectives? Twitter won't tell you. Bionic will shine a spotlight on your Twitter marketing performance and help you to get the most from your Twitter advertising investments. Twitter offers fantastic advertising programs. One of the great things about advertising through Twitter is the set of real-time performance metrics it provides. However, Twitter (like all other advertising platforms) won’t tell you if your Twitter ads are hitting your marketing objectives. For example, Twitter will tell you it delivered 87,620 impressions in a given period. Is that good? That depends on what you had planned. If you were planning 80,000 impressions, then it’s good. But if you were planning 100,000 impressions, then it’s bad. The math gets really complicated when you are on day 17 of a 55 day campaign. Do you really have the time to do all these calculations? Or would you rather show up to work in the morning with all your results versus your performance objectives presented on a friendly dashboard? The Bionic Marketing Performance Management system is a great companion to your Twitter advertising. It will help you to make sense of your Twitter performance data. 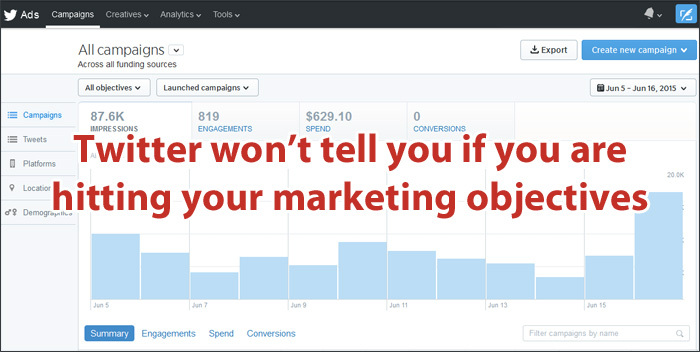 It will tell you whether or not your Twitter advertising is on track to hit your marketing objectives. It provides you with daily health status on all your key performance indicators. This video demonstrates how Twitter and Bionic work together and how Bionic gives you better insight into the performance of your Twitter advertisements. According to the Chief Marketing Technologist Blog, a typical marketer uses more than 100 software systems to execute their marketing programs. If you are like most marketers, Twitter is only one of many marketing platforms of which you need to manage the performance. The Bionic Marketing Performance Management System can help you to manage your marketing performance across all of your platforms such as Google AdWords, LinkedIn, Facebook, DoubleClick Campaign Manager (DCM), DoubleClick Bid Manager (DBM), Google Analytics, Sizmek, Mediaplex, Eyereturn, and RevTrax – all in one dashboard. 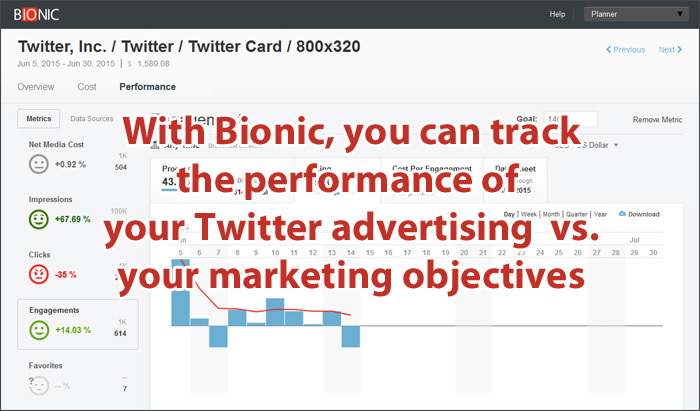 To learn more about how Bionic can help you to manage the performance of your Twitter Advertising and all your marketing platforms, request more information. Includes Google AdWords, Facebook, LinkedIn, and other performance management modules.